The project on Ryan Camp is a work of research in motion. For the general public the history of Ryan is somewhat fragmented but new information on its history and current status is being discovered on a regular basis. This section will serve to notice readers when new information is discovered and added to previously published chapters, galleries and the timeline. New Map Gallery entry – March 24, 2019 – Added section of 1955 Desert Quadrangle, Automobile Club of Southern California, showing the Death Valley View Hotel at the site of Ryan. New Timeline entry – Nov. 15, 2018 – The Death Valley Conservancy 2017 Internal Revenue Service, Form 990, Return of Organization Exempt from Income Tax, indicates a net asset or fund balance of $25,962,032. New Timeline entry – April 17, 2015 – Rio Tinto donates $50,000 for National Park Service video project in Death Valley. New Timeline entry – Nov. 13, 2017 – The Death Valley Conservancy 2016 Internal Revenue Service, Form 990, Return of Organization Exempt from Income Tax, indicates a net asset or fund balance of $23,932,417. New Timeline entries – April 27, 1985 – Henry Joseph Golas, age 27, an associate producer in motion pictures, married Patricia Mary Berns, age 30, a graphic designer in advertising, in Death Valley’s Furnace Creek. Golas will later become a board member of the Death Valley Conservancy and play an important part in the future of Ryan Camp. – Jan. 14, 1987 – Henry Golas registered the Tomesha Corporation as a domestic stock company listing himself as the president of the corporation in Santa Barbara, California. – June 27, 1988 – Henry Golas Tomesha Corporation comments to Death Valley National Monument Superintendent Ed Rothfuss regarding the Draft Environmental Impact Statement and Draft General Management Plan. – March 22, 1992 – Los Angeles Times article by Mark Ehrman about Burton Frasher and the Frasher Photos post cards of the early 1900s. Post cards in box sets of eight showing 1930 scenes of Death Valley were offered for sale in Death Valley National Monument by the Tomesha Corporation. New Timeline entry – May 2007 – Thomas Albanese becomes the chief executive officer of Rio Tinto. New Timeline entry – July 21, 2009 – Death Valley National Park Superintendent Craighead received a phone call from Rio Tinto advising that Rio Tinto made the decision to not donate Ryan Camp to the park service. New Timeline entry – Nov. 8, 2016 – Death Valley Natural History Association Telescope newsletter, “Sustaining the Legacies: Mining and Death Valley” by Nathan Francis, Board Chair DVNHA. New Timeline entries – May, 22, 2005, Jan. 22, 2008, March 9, 2008, and Dec. 9, 2009, Death Valley Conservancy creates domain names. New Timeline entry – Nov. 13, 2015 -The Death Valley Conservancy 2014 Internal Revenue Service, Form 990, Return of Organization Exempt from Income Tax, indicates a net asset or fund balance of $24,101,473. New Timeline entry – Nov. 12, 2014 – The Death Valley Conservancy 2013 Internal Revenue Service, Form 990, Return of Organization Exempt from Income Tax, indicates a net asset or fund balance of $23,559,830. Nov. 7, 2014 – Made edits to the Introduction and Timeline entry of March 25-30, 2011 to clarify that it was the decision of the San Jose State University Field Studies in Natural History staff to hold the 2011 session in Furnace Creek. Nov. 1, 2014 – Chapter 3 – Added proposed boundary addition map dated June 2009 to illustrate email discussions June 18, 2009. 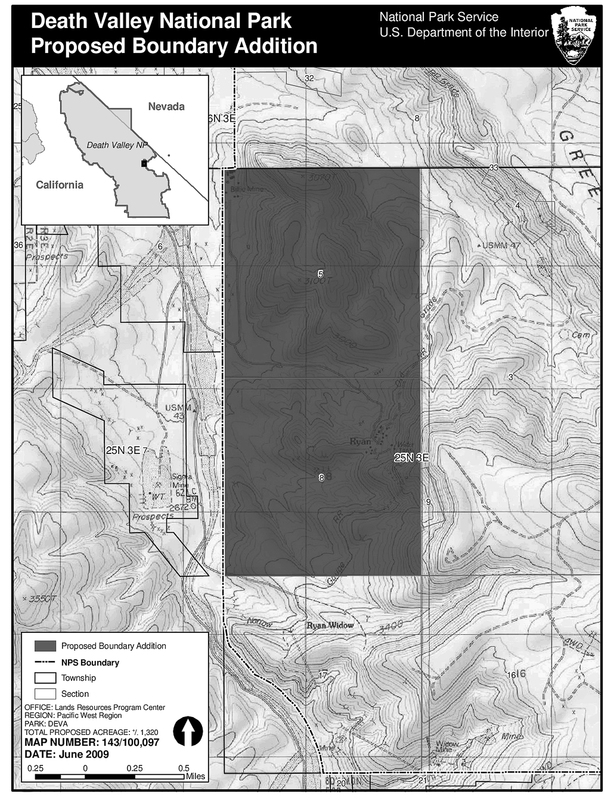 New Timeline entry – July 24, 2014 – US Borax notice of intent to hold mining claims and mill sites. New Timeline entry – August 30, 2013 – In the Superior Court of California, County of Santa Barbara, Case number 1415232, the Death Valley Conservancy is mentioned in a Tentative Ruling. This case may be viewed on the court website by searching under case number 1415232 or view the Tentative Ruling. Ryan Camp, Death Valley, California. Feb. 12, 2013.